A picture has been released of a man whose charred remains were found in a suitcase in a north London garage. Detectives believe he was kidnapped from his flat and murdered and his body put in the case. 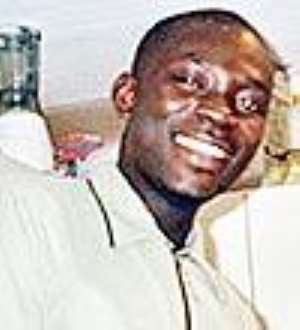 The Ghanaian man, aged about 25, lived as Jeff Mensah in North Street, Plaistow. He also used the name Kwaku Amah and may have disguised his true identity after entering the country illegally. Inquiries in Britain and Ghana have revealed no trace of anyone with either of the two names. Police attended a fire at the house on 8 December. No one was inside but extensive damage had been caused to the upper floor. The body was found in Edmonton the day after. Police are issuing the photograph in the hope that someone may come forward and identify the victim. They say they are not interested in the immigration status of any witnesses. DCI Terry Geraghty said: "We need to inform his family and determine a motive for the murder." Forensic science experts retrieved a piece of lining from the suitcase with the words MULTI STAR. Detectives have issued descriptions of two men believed to have abducted the victim. One is a light-skinned black man, taller than 5ft 8in and of medium build, seen wearing a baseball cap, high-neck jumper, trousers, gloves and a yellowand-black patterned mask. The second man is a darkerskinned black male about 5ft 8in tall, of slimmer build, seen wearing a round-necked jumper, gloves and mask, all of them dark coloured. Anyone with information is asked to call the incident room at Barking police station on 020 8345 3865 or Crimestoppers anonymously on 0800 555111.